The Arctic Blue Navy Strength Gin has received recognition before at industry awards, but has now been perfected to being market-ready. The 2019 World Spirit Awards featured close to 3 000 entries from around the world all in all. Arctic Brands Group won the Best in Show and Best in Class awards, of which the former is generally recognised as the highest award for a spirit in the US and received 1 000 entries this year. The Best in Show award also comes with a significant distribution deal in the US. “We went to the competition to test our product, to see where we’re at with the product,” said Mikko Spoof, brand director at Arctic Brands Group. “But now we’re going to have to take the product to the market as soon as possible. We don’t even have a final label for it yet!” Spoof chuckled. The Double Gold recognition means that all of the 19 blind-tasting judges gave Navy Strength Gin a gold rating. This isn’t entirely new for Arctic Blue Gin product family: the first product of the family was awarded Double Gold and Spirit of the Year Award in Germany in 2018. For a company that set out to create the best gin in the world, the recent awards raise the question of what’s left and what’s next. 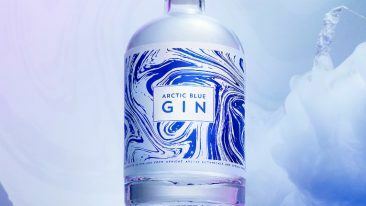 Arctic Blue Gin will also gather attention at the Monaco F1 Grand Prix after signing an agreement with the official after-party venue of the competition.